Eleven Craftsbury Green Racing Project skiers and three coaches took their training to Slovenia and Austria this month to check out Planica's new ski tunnel (in a three-level parking garage) then more snow time 9,000 feet above sea level at the Dachstein glacier. Race results and records from the last 10 year of the Climb to the Castle rollerski race up Whiteface Mountain near Lake Placid, N.Y., courtesy of the New York Ski Educational Foundation. Guess who's won it five times? For the Canadian World Cup Team, September entailed a trip to the Italian Alps for altitude training. Alex Harvey, Devon Kershaw, Lenny Valjas, Graeme Killick, and their coaches ventured to Livigno and Stelvio Pass, and joined the Norwegian men's team for some workouts. Everything's better with a group -- at least in terms of threshold interval workouts. In this "Throwback Workout" from three years ago, U.S. women's coach Matt Whitcomb explains why this was one of the best workouts he had seen back then. “It doesn’t need to be incredibly hard — today was roughly threshold and above during bursts of speed — but it was about the terrain that helped push the pace for us,” he said. 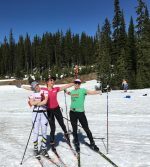 After recently returning from a training camp with the Norwegian women's team, Jessie Diggins describes how the opportunity came about and one of her favorite workouts from her week in Norway. "I’m always looking for ways to make summer training exciting, new and adventurous," Diggins said.